Our voice is also an expression of our power. Through our voice, we can claim our place in the world. The energy and sound of our voices can have both positive and negative intention and impact, as can our words. The voice and the person are indivisible. As Stengel and Strauch say, ““work on the voice, whether conscious or subconscious, is always also work on the self”. Andrews writes: “No problem exists in a discrete form. Any problem that affects the ability to communicate creates social and emotional difficulties. Similarly, social and emotional problems can themselves create or exacerbate communication disorders.” Effective development of voice and communication skills therefore needs to take account of both the physical dimension of voice (how the body produces the sound most efficiently and healthily), and the personal dimension (the inner landscape of the person, and their social and relationship context). So, the next point on the pentagon is the BODY. The physical process can be simplified into three components: the Breathing mechanism (which is governed by many muscle systems, and influenced by how we align and move ourselves); Vibrating source (the vocal folds, the structures that surround them, and the muscles that act most directly on them); and the Resonating system (the structures and muscles that influence timbre, resonance, and articulation, the conversion of the raw sound signal – the ‘note in the throat’ – into words). Our biological inheritance, our genetic make-up plays a role in the sounds we can make, but is the least significant element. A great voice is not so much about the accident of genetic inheritance, but how we use what we have. An important part of all vocal training happens at this physical level. 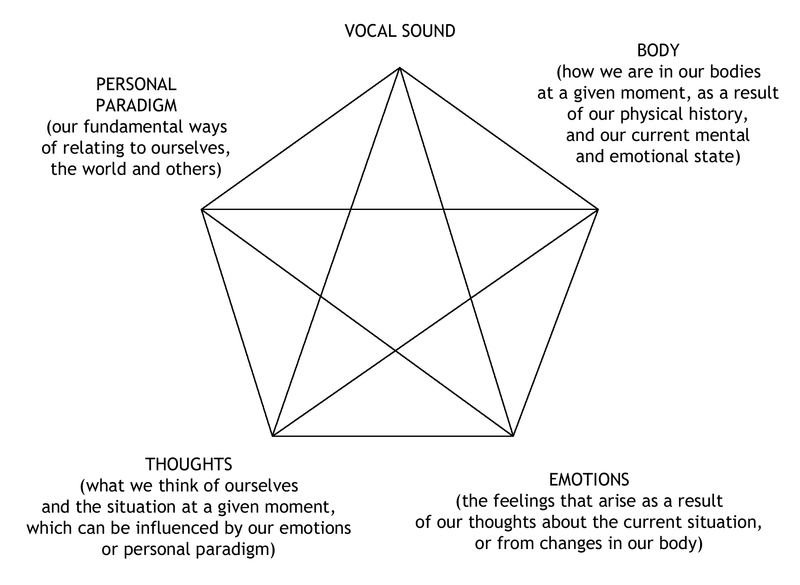 There are sound anatomical principles that govern the healthy and free production of vocal sound. 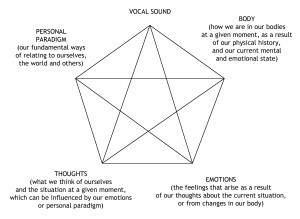 It is useful to be able to distinguish these sound and logical methods from the mass of misinformation and incomplete understandings that abound in the voice training world. Any good voice trainer should be able to describe exactly in precise detail the physical basis of what is happening, and why something works. Effective physical technique can also enhance the delivery of what we want to say or sing. Emotions clearly have a physical dimension – they are always felt in the body, albeit sometimes subtly. Emotions also always have a cognitive component. With practice, we can track through our internal process, and discover that there are THOUGHTS that are triggering our emotional states. For example, it is not difficult to recognize which thought process will serve me better – ‘Will I speak / sing well in the next few moments, or will I make a complete fool of myself?’ or “Whatever happens now, whatever sounds / words I emit, whatever responses come from others, none of this has to affect my internal equilibrium.” As well as affecting our emotions, our thoughts can also directly help or hinder the conscious instructions we give to our bodies in the physical technique of sound production. How we think about the situation also governs the words we choose.